Rob Cox, the editor of breakingviews.com (the financial commentary division of Reuters) spoke with two groups of students and faculty on the SUNY New Paltz campus this month. Cox is also a resident and native of Newtown, Conn., and is one of the founders of Sandy Hook Promise, a national nonprofit organization led by several family members of victims of the Sandy Hook Elementary School tragedy of December 2012. He spoke to students of psychology and disaster mental health about his experiences working with this group to address the root causes of gun violence, and read from “When Your Town is Newtown,” an essay Cox wrote for The Wall Street Journal in the days following the shooting. “For now the priority is to support those most directly affected,” Cox said. “What we know is that, from now on, when my children tell people they hail from Newtown, there will be immediate recognition, perhaps even a stigma. Cox also sat for a Q & A with journalism students and faculty moderated by Assistant Professor Lisa Phillips, at which he spoke about his career and shared his insights about the virtues and the challenges of working as a reporter. 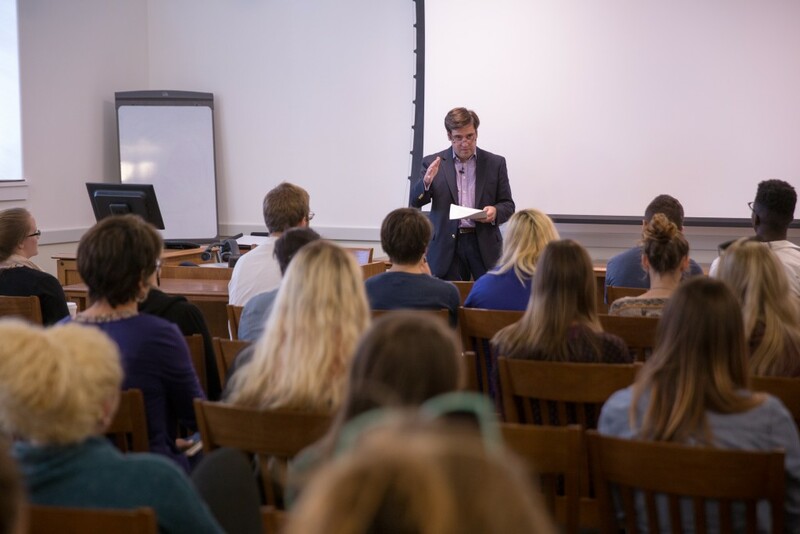 Cox’s visit to campus was sponsored by the James H. Ottaway Sr. Endowed Professorship and the Department of Digital Media and Journalism.